There are three pairs of major salivary glands located in and around the mouth and throat: the parotid, submandibular and sublingual glands. 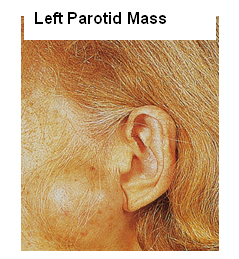 The parotid glands are the largest and overlie the angle of the jaw in front of the ear. From the gland a duct drains saliva into the mouth. The submandibular glands lie deep to the horizontal portion of the lower jaw and their ducts enter the mouth under the tongue. 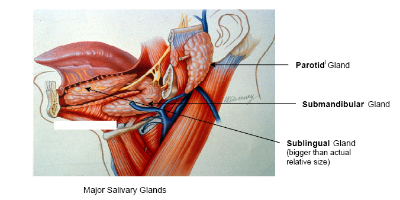 The sublingual glands lie close to the submandibular ducts. In addition to the major salivary glands there are thousands of minor salivary glands present throughout the lips, mouth and throat. Approximately 1 to 1.5 litres of saliva is produced per day. Saliva is 90% water, but also contains proteins that both aid digestion, and keep the mouth and teeth healthy. Obstruction to the duct of one of the glands. This may be due to either a stone or a narrowing of the duct. Gland swelling typically occurs during eating and is painful. The swelling is caused by saliva build up in the obstructed gland and this can become infected. Stones are most common in the submandibular gland, but occasionally occur in the parotid. These are most common in the parotid gland. 80% are benign (not cancers) and typically present as a slowly growing salivary mass. The risk of a salivary lump being malignant is higher for submandibular tumours (50% are cancers), and most tumours occurring in the minor salivary glands are malignant but these are rare. The presence of enlarged neck lymph glands (although this may also be found with inflammatory lesions). The most common benign parotid tumour is a Pleomorphic Adenoma which is solid. The second most common benign lesion is a Warthins Tumour which is cystic (Cyst-adenoma), and most commonly found in the inferior portion of the parotid. They present as a firm but mobile mass but they can become quite large if left untreated. The majority (80-90% of parotid tumours) occur in the superficial aspect of the gland (superficial to the facial nerve) because 80-90% of the gland is superficial to the nerve. In 10-20% of cases, however, tumours occur in the deep part of the gland, and such lesions can even present as a lump in the throat with expansion of an area called the parapharyngeal space at the back of the mouth. In this latter setting the lump may be visible by looking inside the mouth. Benign salivary gland tumours only rarely cause facial weakness, a finding that is virtually diagnostic of malignancy, however pleomorphic adenomas have a risk of malignant change over a long period of time. The most common malignant tumour (70+%) of the parotid gland in New Zealand occurs as a result of involvement of the lymph glands present in the parotid by either a Squamous Cell Cancer (SCC) or melanoma (MM) of skin of the face or scalp. There may be a past history of a previous skin cancer (SCC or MM) but in a small percentage of patients there is no known previous skin cancer. These are highly aggressive tumours that often also spread to lymph nodes in the neck. These tumours can involve the facial nerve causing facial weakness. The mass feels hard and irregular and can be fixed to deep structures and/or invade the overlying skin causing discolouration or ulceration. They may be palpable lymph nodes in the neck most frequently in the upper deep cervical region (level II) immediately below the parotid. See "Neck Dissection" in this website for classification of neck levels Primary parotid cancers are rare. As with the more common metastatic SCC or Melanoma cancers they are usually hard and irregular, can involve adjacent structures or skin and can result in facial nerve invasion and facial muscle weakness. 50% of these are malignant. The mass is below the jaw. If malignant, they can invade adjacent structures and cause facial weakness and abnormalities in tongue function. If malignant, there again may be associated with enlarged lymph nodes, most commonly at levels I and II (see " Neck Dissection" for classification of neck levels). The commonest tumour here is a mucous cyst called a Ranula (a term derived from the Greek word for the swollen area below the mouth of a frog). These may be confined to the floor of the mouth (simple Ranula), or they may extend down into the neck: a plunging or diving Ranula. Cancers of the sublingual gland are rare and usually present as a hard mass in the floor of the mouth and can often involve the lingual nerve causing numbness in the floor of the mouth and tongue. e. Minor Salivary Gland Tumours. These are rare and virtually all are malignant. They are most common in the palate. The most common type is an adenoid cystic cancer which has a tendency to invade along nerves and has a high incidence of local recurrence irrespective of the treatment employed. Fluid is aspirated through a very fine needle, which is placed in the lesion. The cells in the fluid are then examined under the microscope to give an indication of what the lesion is. FNA is mainly used to differentiate benign from malignant tumours, and may be employed in the evaluation of either salivary gland lumps or adjacent enlarged lymph nodes. This is often the single most important investigation. However it is only 80%-90% accurate and results must be interpreted hand-in-hand with the clinical findings. Ultrasound is useful in the diagnosis of many parotid lesions and submandibular gland lesions. It can help differentiate whether a lesion is within a salivary gland or next to the gland, and whether a lesion is cystic or solid. CT scanning may be appropriate for large parotid lesions, if there is suspicion there is a deep extension, or if the tumour is malignant. Sialography involves injecting radiological dye into a salivary gland duct and taking X-rays of the duct system. It is not useful for investigation of tumours but is useful in evaluating recurrent gland swelling where there is no obvious stone where either a small stone or stricture is suspected. 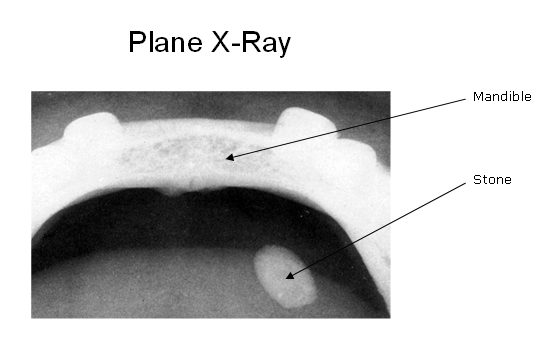 Plain X-ray may be useful to evaluate suspected stones in the salivary gland and the best X-ray view is often obtained with a "panorex" view. Surgical resection is required for all salivary tumours. Clearly all cancers require resection, and benign tumours will continue to grow if left untreated. The extent of the operation depends on the type, position and size of the tumour. Usually only a portion of the gland containing the tumour and a margin of normal gland is removed. If the tumour involves the deep lobe, is large or is malignant, or involves severe inflammation the majority or all of the gland is removed. Rarely, with advance cancers, the facial nerve may need to be removed (sacrificed). 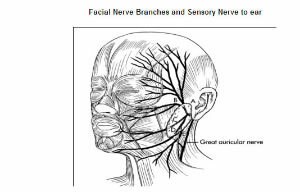 See Fig below showing branches of facial nerve supplying muscles of the face (Branches are shown A-E and these are Temporal, Zygomatic, Buccal, Maxillary, Mandibular, and Cervical respectively) The great auricular nerve supplying sensation to the ear is also shown. This sensory nerve is often divided during parotidectomy and results in ear numbness. Fig below showing anatomy after removal of superficial parotid lobe. 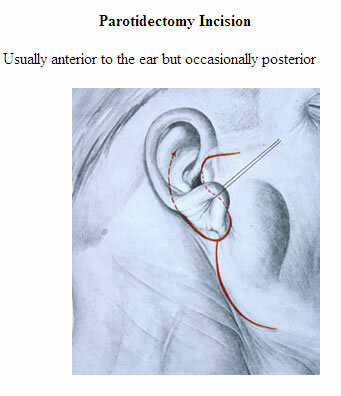 Ear is R superior just above main trunk of nerve. Nerve branches are on left. If lymph glands are involved with a malignant parotid tumour, they usually need to be removed. This involves performing a Neck Dissection of the involved lymph glands. 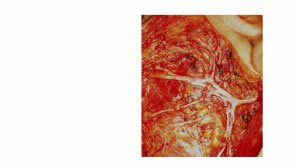 See section on Neck Dissection in this web site. a. Facial nerve injury. The key to parotidectomy is finding and preserving the nerve that supplies function to the muscles of the face. The facial nerve runs through the parotid gland separating the gland into Superficial and Deep Lobes. Temporary weakness of a portion of the face is a 10% risk while permanent weakness is rare particularly in benign tumours. With cancerous tumours, occasionally a portion of the nerve needs to be sacrificed to get clearance of the tumour, as a result facial nerve injury is more common following parotid surgery for cancer. In addition, the risk to the nerve is much higher in recurrent or re-do parotid surgery. 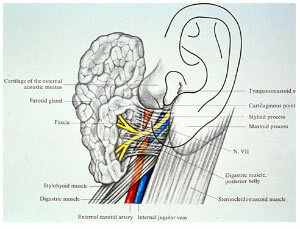 b. Sensory nerve injury The great auricular nerve runs through the back of the superficial part of the parotid (see Fig above) and this can sometimes be preserved. Division of this nerve is often necessary and this results in numbness of the ear which usually is of little consequence and recovers to a large extent with time. c. Bleeding Bleeding into the operative site may require a return to the operating theatre for removal of the clot and control of the bleeding point. Again this is approximately a 1% risk. e. Facial sweating (Freys Syndrome) Some patients develop abnormal sweating of the skin over the parotid or submandibular gland following resection. This is due to the Parotid or submandibular nerves which are saliva producing nerves growing into the sweat glands of the skin over where the gland has been removed. It is not common for this to be a major problem, but should this occur treatment involves botox injection into the overlying skin. Post operatively one to two nights in hospital are required and normal activities can be resumed in one to two weeks. This operation is performed under general anaesthetic. The incision is made in the neck about two finger breadths below the lower border of the jaw in a skin crease. The gland is removed usually with a small portion of the duct. If there is a malignant tumour a wider excision may be required possibly along with dissection of regional lymph nodes (see Neck Dissection). Facial nerve injury. Nerve injury: There are four nerves at risk. The Marginal Branch of the Facial Nerve supplies muscle function to the lower lip is the nerve most at risk. Injury to this nerve is usually temporary. The Lingual Nerve supplies sensation to the floor of the mouth and side of the tongue. Numbness of these areas will occur if the nerve is injured. The hypoglossal nerve supplies the muscles of the tongue and injury can involve deviation of the tongue to one side. Both of these injuries are rare. Sensory nerves in the area may be injured resulting in numbness around the jaw or neck. This is usually temporary. Bleeding Bleeding into the operative site may require a return to the operating theatre for removal of the clot and control of the bleeding point. Again this is a 1% risk. These occur in various sites including the lips, mouth, nose and throat. The surgery involves local resection of the tumour and whatever surrounding soft tissue or bone is involved in order to get a clear margin. The most common problem with the sublingual gland is development of a mucous cyst called a Ranula. Treatment is usually simple excision through the mouth although more extensive Ranulas (Diving or Plunging Ranula) may also require a Neck incision. Sublingual cancers are rare and require wide excision +/- node dissection. Most salivary gland cancers require adjuvant radiation in addition to surgery. This may be administered post surgery or less commonly prior to surgery. Radiotherapy usually lasts for 5-6 weeks.